Here is an interesting conundrum: a disease that causes chronic pain on the one hand and patients who refuse to take their meds on the other hand. How can it be that these two things exist together? Part of the answer lies in the nature of the disease itself—in this case, we’re talking about arthritis. The word arthritis refers to almost 200 different versions of the disease. In general, arthritis can be divided into two categories: osteoarthritis and rheumatoid arthritis. Osteoarthritis, according to the Arthritis Foundation which is celebrating Arthritis Awareness Month this May, results from the natural wear and tear of joints. Rheumatoid arthritis, on the other hand, is an inflammatory condition where the body’s own immune system mistakenly attacks its healthy cells. It can be a challenge to reverse arthritis symptoms—medical experts say there is no cure. Many people find that living with pain simply becomes a part of their life. Doctors freely prescribe meds, and yet, according to a recent study, many don’t take these meds. This “intentional non-adherence” is rampant. NSAIDs can raise blood pressure. This can be especially problematic if someone with arthritis also has high blood pressure. NSAIDs can lessen the effectiveness of blood pressure medications. And the drugs could also play a role in the development of atherosclerosis. NSAIDs do this by triggering the growth of smooth muscle cells inside arteries, making them “harder” and more susceptible to fatty deposits. Common NSAIDs prescribed to arthritis sufferers include COX-2 inhibitors which could even increase the risk for having a heart attack. But side effects aren’t the only deterrent that keeps arthritis patients from taking prescription drugs—cost is a major factor as well. Popular NSAIDs like “Celebrex” and “Voltaren” can cost upwards of $200 for a month’s supply. Then, there’s the issue of the sheer number of pills that have to be taken on schedule. If arthritis patients are truly to be helped through medication, scientists need to work together to find drugs that have minimal side effects. Risking your heart is just not good enough. Drugs that are affordable also need to be manufactured. Any chronic disease puts patients in a bind. Is it easier to simply live with symptoms or to pay for expensive medications that cause side effects? The choice should be a different one. For some, this choice involves turning to natural medicines like glucosamine and chondroitin. Suffering from a painful condition is challenging enough, but having to deal with large out-of-pocket expenses just puts a further burden on arthritis patients. Making profit out of people’s pain and misery shouldn’t be a priority for drug companies. Governments need to intervene to create safe and affordable medicines for those who really need it. On this World Autoimmune Arthritis Day, we want to encourage you to become more aware of the need for more research and more treatments to help cure this debilitating condition. Happy Arthritis Awareness Month! Educate yourself on how we can all do our part to find a cure. “Cardiovascular side effects of NSAID painkillers,” Harvard Health; http://www.health.harvard.edu/press_releases/nsaid-side-effects, last accessed May 14, 2013. “Arthritis Awareness Month,” Arthritis web site; http://www.arthritis.org/about-us/arthritis-awareness/, last accessed May 15, 2013. 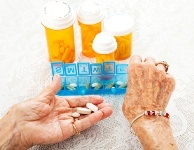 “Treating Osteoarthritis and Pain,” Consumer Reports: Health web site; http://www.consumerreports.org/health/resources/pdf/best-buy-drugs/Nsaids2.pdf, last accessed May 14, 2013.